Thank you to all the new visitors this week for all the comments. I’m really enjoying being part of the blog week, although I haven’t had as much time to read other blogs as much as I would like. I would like to introduce you to the lovely lady in the photo above. You probably won’t have heard of her (although Gill – you probably remember her), but she is part of the reason I’m blogging about knitting here today. 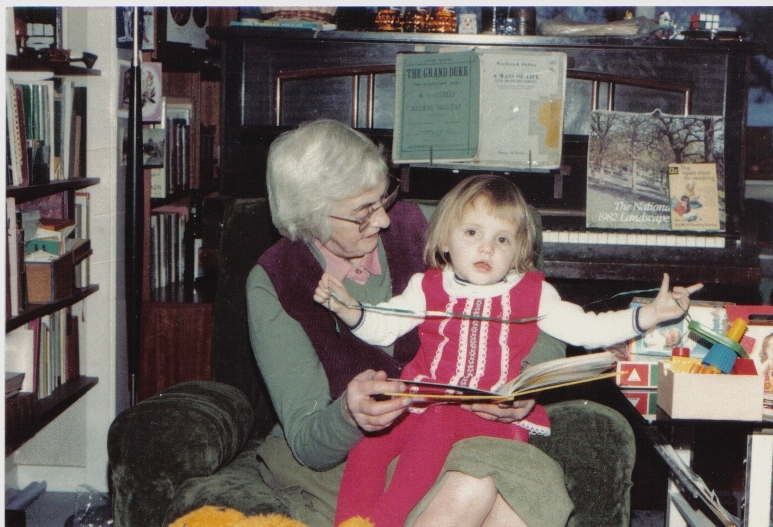 The person in the photo is my Gran, known to most as Gilly V. In case you were wondering, the child in the photo is me, the occasion was my second Christmas. You can tell it was a feast-day since Gran appears to be wearing a skirt, a most unusual occurrence. Gran was a knitter, possibly even a Knitter. When she wasn’t baking cakes or reading endless stories to my little sister, she was knitting. It was the 1980s, so the available yarn wasn’t great. She mostly knitted on long straight needles in slightly scratchy acrylic, but the volume of knitting was impressive. My sister and I had bright red v-neck jumpers for our school uniform. My Dad had (or rather ‘has’ – I think he’s still wearing them) a multitude of tastefully cabled tank-tops. I’m sure there was a lot more that I wasn’t aware of as well. I remember sitting at my Grandparents’ house, having turfed Gran out of her favourite chair, sitting, mesmerised by the click, click of her needles as the stitches effortlessly slipped between the needles. I don’t think she very often looked at the knitting, just sat, a little hunched, and let the knitting happen. What happens when you have too many stitches? Oh, that’s easy, just drop a stitch. My sister heeded my advice (she learned later that this isn’t always wise), and when Gran returned, it was to find a very cross small girl with very holey knitting, shouting at me. Time has healed the psychological wounds resulting from this encounter with knitting – I don’t actually remember what happened after this. I am afraid to say, however, that I never touched another knitting needle for 20 years or so, although I did later learn to crochet. So, apart from being my Gran, why is she my knitting hero? It really comes down to two things. First, for making the concept of knitting familiar to me, for introducing it to me and showing how it can be a part of life. When a friend (Hi Daisy!) showed me how to knit a few years ago, the lessons from Gran were merely dormant: my hands remembered and it all came back to me very quickly. My family is really into trains. Gran wanted to express this through her knitting, so she made an intarsia Thomas The Tank Engine jumper for me. She made a second one for my sister. Truly, this was beyond the call of grandmotherliness! 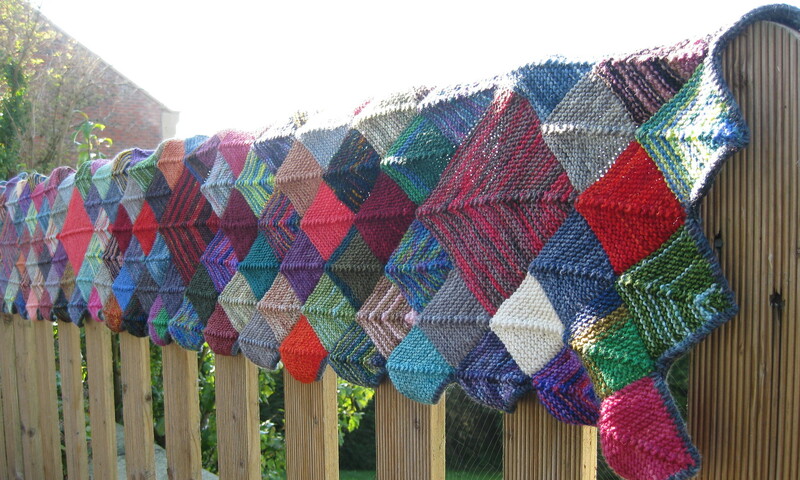 I’m not a fan of intarsia, neither am I a fan of knitting anything twice (except socks and gloves – usually). I’m fairly certain that Gran would be horrified at the amount I spend on knitting tools and yarn. She might call me a yarn snob and wonder why I knit nearly everything on lovely wooden circular needles. She would probably say that I should knit more for my children (they grow too fast – I like my knitted things to last…) and she might say that I should not waste time knitting fancy socks. I’m absolutely sure that Gran would be thrilled that I am knitting regularly. Gran died when I was about 13, so I never got the chance to ask her about her knitting. I wish I could find out a little more about her knitting story, but I’m grateful for the memories I have. 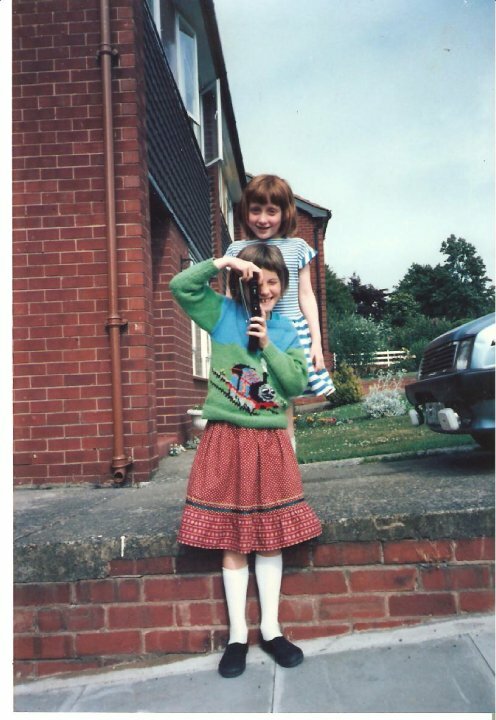 Those are truly impressive intarsia jumpers – I had a horse one, complete with mane! You were worried you’d misrepresented me… I’d say that’s pretty spot on, though I think you were 13 when Gran died, and I remember our first knitting efforts as being strips ten stitches wide. I made a longer, multicoloured version and giving it to a friend masquerading it as a ‘bookmark’! I guess it was never used!! And Dad most certainly still wears one pullover that Gran started though it is the one she was knitting when she died, and a friend of Auntie Moll’s hac to finish it. Don’t think I ever knew about the teddy jumper. What did you do with the wool?